Set in the 1960s, Albert Campion decides to visit the Suffolk wool town of Lindsay Carfax (loosely based on Lavenham) after Superintendent Luke, his old friend of the Bury St Edmunds CID, hints that there could be dark things happening there. Anyway, his grand-daughter Eliza Jane Fitton has settled in the town as an artist and can hopefully guide him around. He is shocked to discover that this little town is apparently run completely by one family the Carders, who bypass the parish council, the rating authority and the local police and instead maintain it as their own fiefdom. Albert stays in the local Woolsack pub and gets to know the other residents and starts to hear about some very unusual deaths that occurred a few a few years previously in which a couple of young archaeology students from Cambridge University who were working on a local project were killed, and perhaps murdered, after taking undiluted LSD drugs. After some long conversations and a lot of questioning with assorted locals in the Woolsack and elsewhere Albert is invited on a shoot by a wealthy member of the community and regrettably an attempt is made on his life. Albert is forced to convalesce from his injuries in his old Cambridge college and here he bumps into a couple of associates from his past and learns a lot to his advantage. 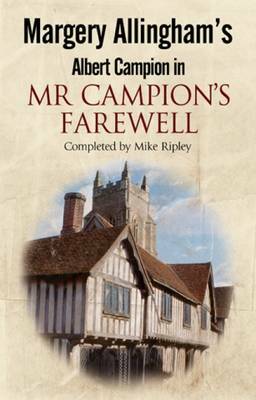 MR CAMPION'S FAREWELL is a must for fans of the Golden Age of British crime fiction. The story meanders on very slowly building up the characterisation and the skilful descriptions of the various businesses in the town and the various personalities of their owners. I have read a few other witty books by Mike Ripley before, in his fifteen-book series about "Fitzroy Maclean Angel" and also some of his many reviews, and so I'm familiar with his impressive skill at writing mystery books with a lightly humorous touch. I have also read a few of the original early "Campion" stories and I'm impressed that he has so adroitly managed to reproduce the original skills of Margery Allingham apparently with so very little effort. The author has written an impressive historical mystery which should be enjoyed without reservation by the many Margery Allingham fans for many years to come and I understand there could be further books. Recommended.